Not so much buy as swipe Bob, not to blame though as a bigger boy made me do it. The Food Warehouse must be doing good business after a slowish start, they are now open until 10 pm Monday to Saturday. 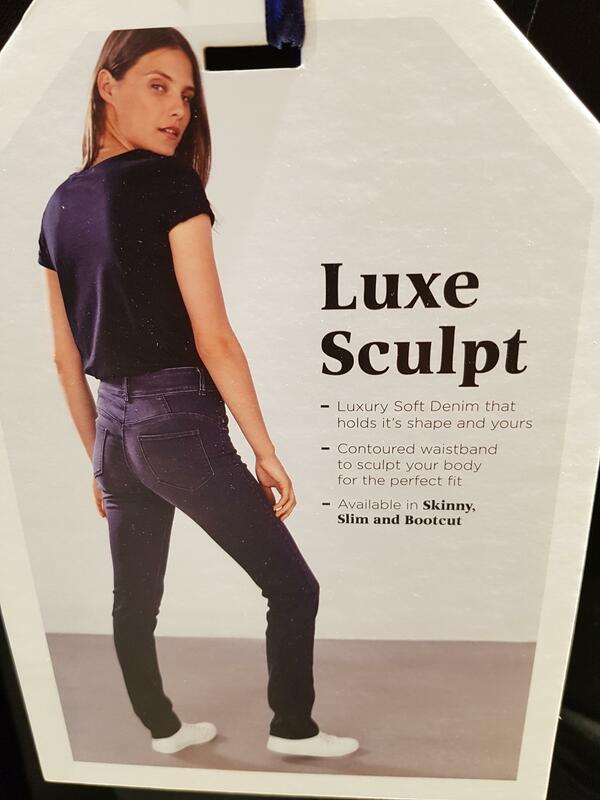 They probably realised they were loosing potential customers to the other late night stores like Morrissons and Tesco, whether these late hours for any of them are cost effective is a different matter. Two benches have been installed in St James, one facing Trespass and the other facing an empty unit to the side of Greggs. Something needs to be done about the free parking soon as many people are parked up all day while they get the train to work and back. Many people intending to shop cannot find a space and go somewhere else to spend their money. But, but, but, don't you remember, it was charging for parking by DDC which was 'killing our town centres'. We even had petitions about it in Deal and pictures of local Labour activists with their best 'sad face' look. [QUOTE="Captain Haddock"]But, but, but, don't you remember, it was charging for parking by DDC which was 'killing our town centres'. We even had petitions about it in Deal and pictures of local Labour activists with their best 'sad face' look. I remember that and pointed out politely that free parking everywhere would only mean money being recouped elsewhere. Town Cllr Ian Palmer promptly blocked me on Facebook to show how adult he was, I blame Reg for voting the bell end in. We can confirm that installation of car park equipment will begin shortly. 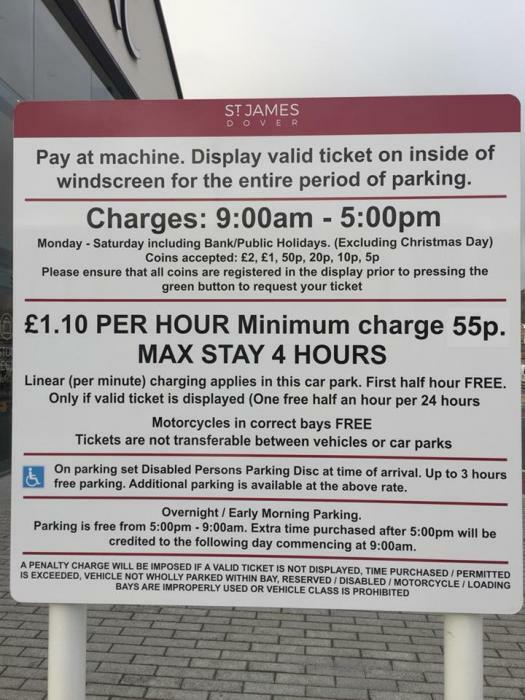 This means we’ll be introducing charges to use the 445-space, pay-and-display car park from Monday 3rd December 2018, bringing it in line with other facilities in the town. Parking charges will be at the same rate that Dover District Council sets for its town centre car parks and will apply from Monday to Saturday. The changes will ensure customers can access more parking spaces giving extra time to explore Dover. So that's a 'Merry Christmas' from all at St James'! The received wisdom currently is that the charges will kill off Cineworld as people will drive to Westwood Cross or Ashford instead!! Considering parking is free at St James after 6 pm when most people visit the cinema it all sounds rather alarmist. From what I have read it should mean that their Christmas shoppers will not have to hunt out a space in a carpark at present full of those who are working or shopping elsewhere in the town. Greggs(when they re-open) or M & S to take into work costs nothing before 9 am, failing that any time during the day there is 30 minutes free parking. Shops are open until 8 & 9 pm meaning plenty of time after work to do heavy shopping. Most people use the cinema well after 5 pm and Travelodge customers are likely to arrive after 5 pm and leave early morning to catch a ferry. I see the disabled get up to 3 hours free parking but that will not stop the grumpy complaining . I trust someone'll go round the signs closing that open bracket. Good news: IMO the penalty charge will not be enforceable in a court because the amount of the charge is not mentioned on the notice. Such charges are only enforceable under contract law and only in the county court. For a contract to be enforceable there must be a specified (or easily calculable) sum of money involved. So if you were to receive a penalty charge notice you could probably safely ignore it. Went through middle of the day yesterday and only about a third of parking spaces were taken up which is good news for the retailers as people wouldn't pay to park if they didn't intend to purchase anything.